Why What You Learned in Kindergarten, is All You Need to Know About Your Nervous System! Many people are familiar with the children’s song, “Dem Bones”. You know the one.” The toe bone’s connected to the foot bone, the foot bone’s connected to the ankle bone”…and so on. Thinking of that song really makes me believe that everything I need to know I learned in kindergarten. Kindergarteners understand that everything in our body is connected, and has an effect on the rest of our body! Somewhere along the way though, we forget what we learned in kindergarten. It all of sudden becomes crazy that something wrong in “your back” could be affecting your stomach. This is why chiropractic is vital to your overall health, not just your back. As you go about your day, your body is constantly sending messages to other parts of your body, in order to keep you functioning and alive. The central nervous system is the complex system of nerve tissues that control the body’s activities. Both your brain and your spinal cord are a part of this system.Your nervous system is your body’s communication system in essence. Without your nervous system parts of your body wouldn’t be able to communicate with each other to keep you breathing, digesting, and pumping blood through you. The nervous system is so complex, that there are multiple systems within the nervous system itself. The most awe-inspiring is the autonomic nervous system. This system is responsible for all the things our body handles involuntarily; meaning that you don’t have to think about doing these functions; your body does it automatically! The autonomic nervous system (ANS), controls things like heart rate, digestion, respiratory rate. salivation, pupillary dilation, perspiration, and urination. Could you imagine if you had to stop in the middle of eating lunch and tell your brain, “I think I need more saliva to help me eat this food.” Or if you’re forgetful, it wouldn’t go well to have to tell your heart to pump, or remind yourself to breathe! Thankfully, our bodies just handle this on their own. Otherwise it would be really difficult to get anything done during the day. I know, right now you’re thinking, “This is all fascinating, but why does this mean that my toe bone’s connected to my foot bone? And why does this mean chiropractic is vital to more than my back?” Great question! If our bodies were a puppet show, our nervous system would be the puppet master; pulling all the strings, and making the show a success. The puppet master is the control system. With us, our nervous systems are the puppet masters, and our bodies functioning are the show. You see, when the brain sends messages to our organs, the message travels down through our spinal cord, out through our nerves, and then to our organs. This is how our organs know what to do, and function at 100%. Now imagine that at the puppet show someone cut one of the strings on the puppet. What would happen? That part of the puppet attached to that specific string would stop working, right? The same thing happens in our bodies. There are things that interfere with our nerves. Now, nobody is coming up to us and cutting our nerve, like the puppet master’s string; but falls, exercise, sports, sleeping wrong, poor posture, all of these things can cause vertebrae (bones in your spine) to move from their proper alignment. When they move, they can irritate and the nerves that run between the vertebrae. This causes a problem with our body’s communication system! Now when a message goes from the brain, to the spinal cord, to the nerve, that nerve can’t properly relay the communication to the attached organ. That nerve is now malfunctioning, and can cause that organ to malfunction. THIS is why chiropractic is vital to your overall health, and not just your back. If you look at a diagram of the nervous system, you will see how the nerves branch out, and wrap around to your organs. This is why it is not uncommon for someone who has been experiencing stomach issues to have pain in their mid back! Chances are a vertebrae is out of place (vertebral subluxation) in your mid-back. Leaving vertebral subluxations untreated can lead to a slew of problems; both minor and major. Think about it. All the other bodily systems are controlled by the nervous system: digestive, respiratory, circulatory, and even immune. So if the nerve that is meant to communicate with one of those systems can’t do so properly, that is a problem! For example, did you know an improperly functioning nervous system is the cause of most allergies? This includes seasonal allergies, respiratory allergies and food allergies. How many people do you know with one or more of those?! As a matter of fact, you probably have at least one of those! I hope this article helped you get back to your kindergarten self! 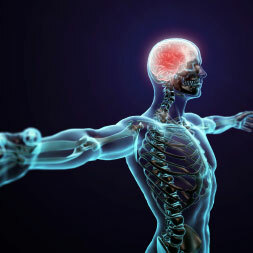 Everything in your body is connected; even beyond your bones! The nervous system is an amazing puppet master, and we want everyone to see your best show. If you’ve been having allergies, stomach issues, headaches, of course back pain, or any other ongoing issue, schedule to see a chiropractor today! Chiropractors are the only health care professionals trained in detection, and correction, of vertebral subluxation. Let’s get this show on the road!